Thai politician who was the 12th Secretary General of the Association of Southeast Asia Nations from 2008 to 2013. 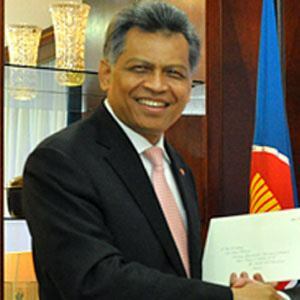 He also served as the Minister of Foreign Affairs of Thailand from 1997 to 2001. He attended Thammasat University, and graduated from Claremont McKenna College for Political Science in 1972. He was a writer for two English newspapers in Bangkok from 1980 to 1992. He comes from a family of Malay descent. He was married to Alisa Pitsuwan up until his death. He had two children. He is a Thai politician like Chuan Leekpai.